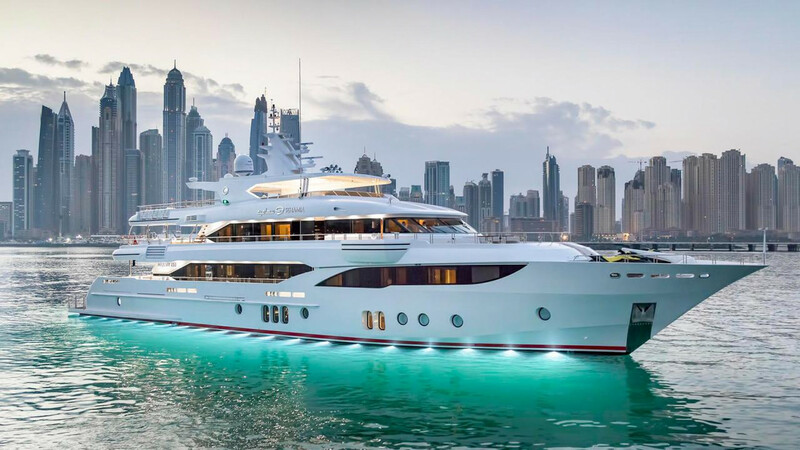 Designed by Yankee Delta Studio, the 47.6 metre My Escape was built in GRP by UAE yard Gulf Craft to RINA class and delivered in 2016 as a Majesty 155 model. Premium quality leathers, marbles and fabrics have been used to decorate the five cabins, accommodating 10 guests and consisting of a full beam master suite, two doubles and two twins, each with a Pullman berth. All guest cabins have entertainment systems and en-suite bathroom facilities while the crew quarters sleep 10 staff aboard. The main deck saloon has large windows and has a range of comfortable, light-coloured settees around four coffee tables and there is also a full wet bar with four bar stools and an entertainment centre including a large flatscreen television set and a stereo surround sound system. A feature here is a fold-down sea balcony on the starboard side. The aft deck has a selection of chairs and tables for al fresco entertaining and dining while the feeling of exterior space is further reinforced by a foredeck swimming pool, aft beach club and a main deck gymnasium. Twin 2,012hp MTU engines enable a cruising speed of 12 knots topping out at 16 knots. Lying in Tuzla, Turkey, My Escape is asking €17,500,000.